This gun has some pitted places that give it a spotted appearance which is distinctive. This is the only prototype I am aware of that has an ejector in the frame rather than on the magazine--even the late prototypes all seem to have the ejector on the magazine. Despite the ejector in the frame, it should be classified as an early prototype because it has a barrel with helical lugs. * Characteristics shared by all known prototypes. J.B. Cargile says the gun did not come with the correct grips. The frame design is for grips without rivets. The missing grips are an easy way for me to distinguish the gun. This prototype appears to be identical with the one owned by Mr. Simmons. It differs from the Aberman prototype in that the ejector is on the magazine. This is an early prototype. No grips, but frame designed for no rivets. 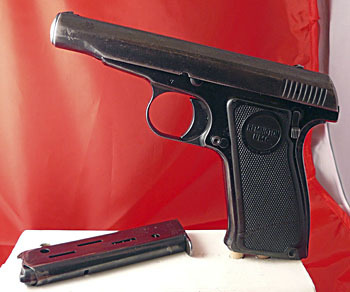 This gun has many of the characteristics of a production gun, such as a pinned barrel, standard extractor, inscription on top of the slide, and grip rivets, but it does not have a serial number in the usual location on the left side of the frame, it does not have an ejector in the frame or a magazine safety, nor does it have any proof marks. There is a number stamped on the back of the grip tang. I classify this gun as an intermediate prototype. No grooves on thumb safety. 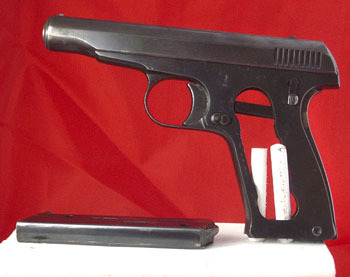 This gun has many characteristics of a production gun, but still does not have an ejector in the frame, a magazine safety, production grips, nor any proof marks. It has a breech block with a removable tail, but has a spring-steel production extractor. I classify this gun as a late prototype because it has a serial number, but it does not have a PA prefix like the gun below. SN7 has several unusual features. First of all, the slide sits forward on the frame about 1/16 inch--the only ill-fitting Remington 51 I have ever seen. Yet, the action works smoothly and, judging from the condition of the gun, it has probably been shot quite a bit. Secondly, the access hole on the right side of the gun, just above and behind the trigger, has a domed plug--the first of its type I’ve ever seen. Finally, despite the fact that the magazine has an ejector spur, it is marked 380 CAL just like a production magazine. and 380 CAL on magazine. 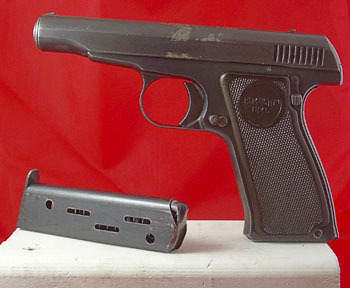 This gun has many of the characteristics of a production gun, including the PA prefix in the serial number and an inscription on top of the slide, but still does not have an ejector in the frame, a magazine safety, nor any proof marks. It is unusual in that the barrel has the .380 CAL marking of a late production gun, but the breech block has a cartridge guide lug and the barrel has an extra notch for it. The magazine also is marked 380 CAL, but has an ejector spur. I classify this gun as a late prototype because it has a serial number. 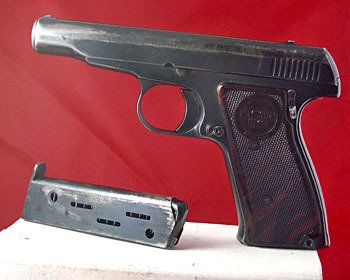 This is one of two .32 prototypes I am aware of. 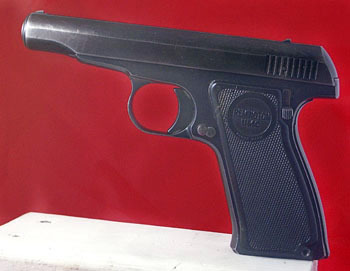 It has all the characteristics of a very early prototype, indicating that Remington had at least considered a .32 version before regular production of the .380 commenced. I do not know the current location of the prototype once owned by Mr. Don Simmons. Serial number 545 was reported by Mr. Simmons to be in the Wells Fargo Museum. When I did some research on the internet, I found there are now eleven Wells Fargo museums. I wrote to the curator at one of them, but never received a reply. If anyone knows which museum holds this piece, I would love to know. 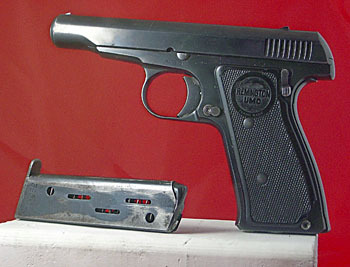 The .380 with the external hammer is in the collection of Mr. Charles Doty. In 2004, Bob Hatfield gave a talk at the Remington Society Seminar on a serial number 2 which he had pictures of from a man in Houston, Texas. I assume the gun is still in the possession of the gentleman from Houston. Click on the pictures to open a larger version in a new window. The guns shown in this article are from the J.B. Cargile Collection. Colt SAAs, and other rare and collectible guns. He can be contacted at any Saxet Gun Show or via email.